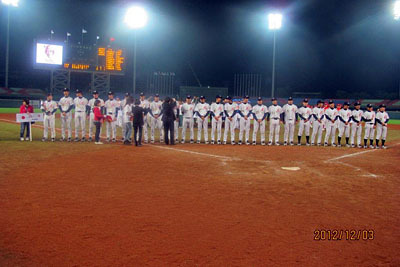 After the 4 major national teams in Asia, Japan, Chinese Taipei, Korea and China, plus Philippines, Champion of East Asian Cup and Pakistan, Champion of West played round robin in Taichung since November 28, Japan claimed 5th consecutive victories winning all 5 games. Taking this opportunity, Chinese Taipei Baseball Association hosted 2nd Executive Committee meeting of Baseball Federation of Asia attended by the EC members of the 5 NOCs and Hong Kong. The agenda of the EC meeting included Reinstatement of Baseball & Softball to 2020 Olympics, alignment of playing rules to those of IBAF, BFA congress in 2013 and development of baseball in Asia.